Rear Admiral (LH) Thomas Ernst is the current Commander Maritime Air NATO, under Allied ­Maritime Command. After years of ­operational experience flying the Tornado, Rear Admiral Ernst has served as Chief of Staff to State ­Secretary Dr. Wichert at the Ministry of Defence in Bonn and Berlin and the commander of the Marine­schule Mürwik. While in command at the Naval Academy, he served as DCOM EUNAVFOR Atalanta at the EU Operational Headquarters in Northwood, GB. The Allied Maritime Command (HQ MARCOM) is prepared to deliver Command and Control (C2) of the full spectrum of joint maritime capabilities. MARCOM is a static headquarters, and plans, conducts and supports joint maritime operations of the Alliance. It maintains comprehensive situational awareness throughout NATO’s maritime area of interest and is ready to execute C2 of a maritime heavy Smaller Joint Operation (SJO-M), and to act as the Maritime Component Commander (MCC) to support a Major Joint Operation (MJO). These generic requirements set the stage for how MARCOM must operate in order to deliver effect. From a maritime air perspective, we are dealing with several inherently challenging intersections with regards to C2. We are interacting daily with national entities and ­assets that operate under national command. This removes the flexibility that comes with having assets under NATO OPCON. We are also dealing with the intersection between NATO intelligence interests and national intelligence interests – which are mostly the same, but exist under different release criteria. However, piercing through these challenges, it is the ambition of COMMARAIRNATO to be able to execute clear C2 from the static HQ MARCOM, interacting with the other entities of the NATO Command Structure (NCS) such as AIRCOM, LANDCOM, and Joint Force Commands, with NATO Force Structure (NFS) elements such as NATO Airborne Early Warning & Control (NAEW&C), STRIKFORNATO and other maritime High Readiness Force Headquarters (HRF(M)), further out to the respective national headquarters, and finally out to the maritime air assets flying within the national and NATO areas of interest. This communication must be carried out through a degraded environment at MARCOM, as well as in degraded conditions for our assets operating in the respective areas. This constitutes a major challenge for an agile command and control – in any type of condition and environment. 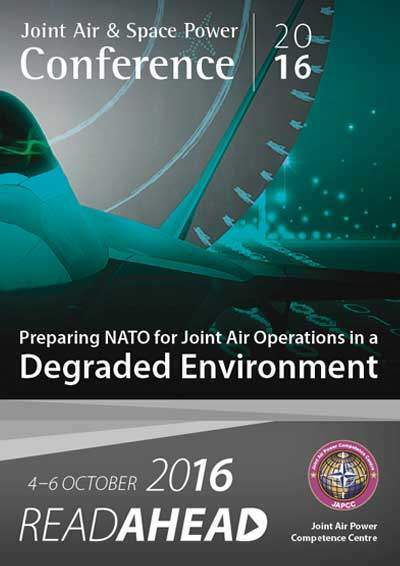 The conference will focus on operations in a degraded environment that results from conditions imposed on us by an opponent that aims to ­contest that environment. Such environments are coming to the forefront of operational planning based on recent experiences as well as new technologies. One emerging focus consists of doctrines and technologies ­under development and employment that facilitate Anti-Access and Area Denial (A2/AD) strategies. These become apparent through new types of warfare and weapon systems. In a maritime sense, we see the employment of submarines and mines for area denial, and the operational and strategic placement of Coastal Defence Cruise Missiles (CDCM) for anti-access. In the maritime air domain, Alliance assets will be vulnerable to new and capable Surface-to-Air Missile (SAM) systems along the coast, impeding the efficient execution of maritime air operations. The revival and ­emergence of hybrid warfare is also shaping plans and capabilities. From a maritime perspective we see extensive underwater research programs underway that can lead to disruption of underwater communication ­cables, we see the use of civilian and merchant vessels for mine laying and obstruction of harbours, and we see civilian fishing vessels carrying SAM threats. These factors are shaping and hindering our maritime and ­maritime air operations in times of crisis and beyond. Additionally, after more than a decade of Alliance operations in Afghanistan, we became ­accustomed to operating without air threats against a materially inferior opponent. In the future, we must also prepare to meet a peer opponent. A degraded environment can become evident through degraded or ­absent satellite navigation, through executing ISR missions with an opponent jamming all-weather Synthetic Aperture Radar (SAR) sensors, and of course, the degradation of communications with our opponent significantly hindering the effective and efficient use of the electromagnetic spectrum through advanced Electromagnetic Warfare (EW) operations. These are just some of the conditions NATO is likely to face, on a small or broad scale. The ACO Forces Standards Volume I (General) states the generic requirements for Alliance operations and entities, through the Main Capability Areas (MCA). This short paper focuses on the centrepiece of these, namely Command and Control (C2). NATO has clear and explicit standards that must be met in order to ­execute C2 in Alliance operations to meet NATO’s level of ambition. Alliance headquarters must be ready to exercise C2 for Article 5 contingencies, to contribute to efficient conflict prevention, and to execute crisis management including Non-Article 5 Crisis Response Operations (NA5CRO). NATO operations will encompass high- and low-intensity combat and any environment: we will operate in extreme conditions, to include desert and arctic areas of operations, in areas contaminated by Chemical, Biological, Radiological and Nuclear (CBRN) weapons and waste, NATO will operate in spite of cyber-attacks and whilst experiencing Electronic Warfare (EW) degradation. Albeit a non-exclusive list, these factors are only a few of the ­challenges we must be ready to meet from a maritime and maritime air C2 perspective. Not only will the maritime component interact with the other components, specifically and likely more regularly with the air component than with any other, but also integrate our forces closely for the establishment of an Integrated Air and Missile Defence (IAMD). As an additional example, the maritime component will work in close collaboration with the air component in the Targeting Process, which demands close coordination and ­exchange of sensor information, and an overall integration of assets and information for a seamless common operational picture. As a maritime headquarters we are required to ensure communications stability, interoperability and coverage to other relied upon entities. This leads to demand for secondary and tertiary communication solutions facilitating ongoing operations, as well as sound operational contingency planning for future operations. More specifically for maritime air units there are requirements for secure and interoperable voice communications – HF, VHF and UHF – in accordance with established standards in MC-195. Modern aircraft are also ­required to be able to transmit sensor information through secure satellite communications. The Alliance demands a wide array within the ­sensor portfolio for maritime aircraft, in order to mitigate the various conditions at sea and to facilitate a collaboration of sensor information in cases where one sensor is not sufficient for various reasons – for example having the sensor partially or fully degraded by the opponent (e.g. SAR jamming). So What Does This Mean to Our C2? Operations in a degraded environment as already described will be a ­challenge. The ambition is simple and focused, but hard to achieve, and the requirements are challenging to meet in such a likely operational ­environment. The goal for MARCOM is to execute C2 of its forces in any environment, even if degraded conditions for the HQ exist at its static location. In order to mitigate this, an alternate operations centre has been set up for redundancy, with backup communications systems. COMMARAIRNATO has the ambition to execute C2 through his established ‘Maritime Air Network’ as described in the Alliance Maritime Governance paper of 2016, and will ­interact closely with all national maritime air entities. The inherent dispersal of units and the diverse geographic location of the Maritime Air Control Authorities (MACA) will likely mitigate a specific effort to degrade C2 ­message traffic and communications in the maritime air domain. There is a weakness that runs through the entire NCS, namely the dependence on NATO Secret Wide Area Network (NS WAN). However, by executing C2 through the respective national entities, if required through our basic message handling system, COMMARAIRNATO hopes to overcome this ­dependence, although a concerted deconfliction and coordination will be much more challenging should the overall Wide Area Network be ­subject to a sophisticated cyber attack. The requirement to execute C2 from the Alliance headquarters to the ­respective assets in spite of a degraded framework for communications is absolute. Most naval airborne assets are equipped with High-Frequency (HF) radio(s), which are harder to jam and degrade than communication carried out over higher frequency bands. This will help in a degraded EW environment. Also, the inherent autonomy with which many maritime air operations are being carried out relaxes the need to communicate often with any other unit. This means that aircrew will find mitigating strategies and tactics to execute maritime air operations without having to rely on communications with another unit or a command entity ashore. The potential complexity of future military operations must not be underestimated. Threats from a peer opponent throughout the spectrum of hostilities, new, advanced, and capable weapons systems, and the ­potential for operating in a degraded environment all complicate ­planning, ­systems procurement and preparations for future operational challenges. So, how can we best prepare ourselves in order to mitigate the challenge of operations in a degraded environment? Infrastructure. We must have a robust and redundant infrastructure. We are highly dependant on Information Technology (IT) and the already mentioned Wide Area Networks. We must have the robustness demanded from a modern IT system to withstand sophisticated cyberattacks. We must be capable of establishing a common situational awareness without a total dependence on shared IT applications. This points towards a second factor worth mentioning, which is competency and knowledge of common and standardized procedures. Procedures. The Alliance consists of 28 nations with various operational experiences from the different regions of the organization. This know­ledge has led to common tactics, techniques, and procedures to which we must adhere, keep updated, and constantly challenge and improve. Common procedures stand out as the backbone of mitigating against loss of communication and IT systems during operations. Training. Training is another mitigating factor that will facilitate the ­complex joint operations of the future. Common basic and advanced training, leading into basic and then complex exercises, is paramount for a coherent effort between the Alliance partners. Our peacetime operations and complete freedom to manoeuvre can quickly evolve into operations in a dense threat environment with degraded communications. This is where the shared procedures, training, and exercises will help to facilitate the common effort necessary to accomplish the Alliance’s objectives in spite of the degraded environment. In short, we must regularly exercise our common procedures. Pre-Planning. A fourth factor that will help sustain operations in degraded environments is the proper pre-planning of such operations. Oper­ational experience shows indeed that ‘the plan is nothing – planning is everything’ – the better we have prepared and thought about potential courses of action of our opponent, the better chance we have of operating in environments that are sub-optimal, and where core communications and movements are being challenged. In the present financially austere environment where we see cutbacks to budgets and the down-scaling of military organizations, we must be able to think outside the box, spend our resources wisely, and utilize our assets efficiently.